Pretty Surface Embroidery Kits – Perfect for Learning! Earlier this week, I was delighted to see some new surface embroidery kits available here in the US. It’s difficult to find commercial surface embroidery kits that employ lots of different stitches – kits that are colorful, fun, and tasteful, so this collection is exciting! 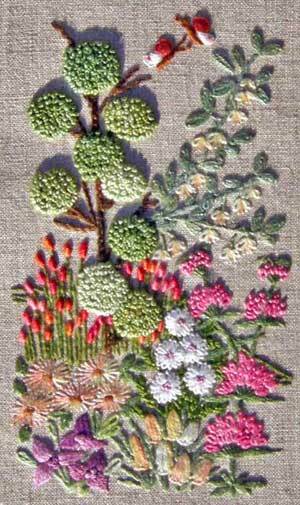 Kits like these are a wonderful way for beginners to learn a myriad of stitches and to see how to employ different stitches in a design. They’re also an excellent way for more advanced embroiderers to enjoy a relaxing, fun project, and to revive an interest in using multiple embroidery stitches in one project. Often, we get stuck in a rut, using the same stitches over and over again, so a fun project that employs more than three or four stitches is a great way to perk up the old stitch repertoire. 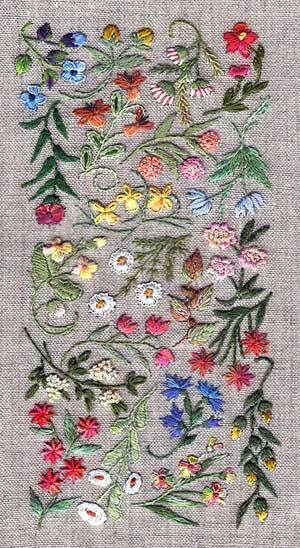 There are seven new surface embroidery kits available at The French Needle. Lisa has been expanding options for stitchers interested in surface embroidery, and these are my favorite additions to her collection of available kits! The design above works up into a 9″ x 9″ square, though most of the designs are quite a bit smaller than that. The kit itself comes with the linen, pre-printed with the design, plus stitch instructions (in English) and a thread list. You can also order the specialty thread pack for each kit (which includes threads by House of Embroidery). The thread packs do not come with any of the required DMC floss, which stitchers can buy locally. Or, you can just order the kit (pre-printed linen and instructions), and use the list of suggested DMC threads. The pieces involve all kinds of flowers and foliage (and this one, a rooster, too!). Some involve more stitches than others. 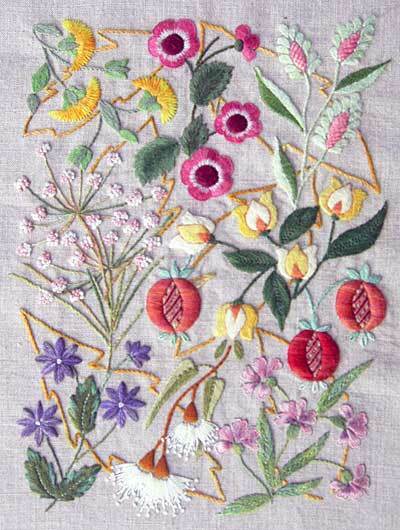 This embroidery design – titled Mille Fleurs – is my favorite of the seven kits. It involves some 13 stitches in a 2.5 x 5″ design. The specialty thread pack that can be purchased alongside it (not including DMC) has 24 colors in it. Lots of color, lots of stitches! Because most of the designs are small, the projects are quite manageable, time-wise. This is another 2.5″ x 5″ design, printed on 8″ x 10.5″ linen. 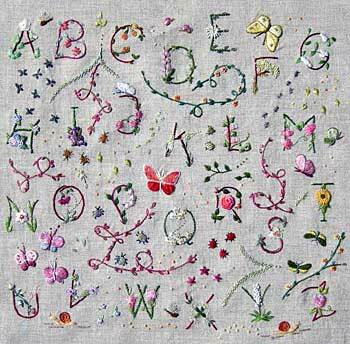 This flowered alphabet kit is 12″ x 12″ square, and includes 16 different stitches. The specialty thread pack includes 31 colors. 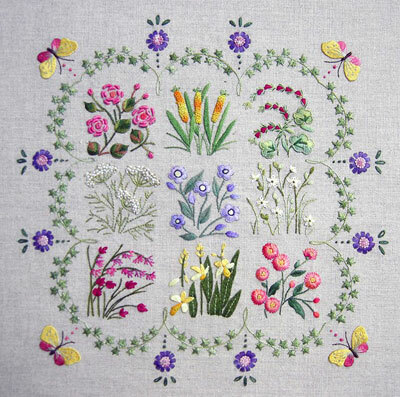 So, if you’re on the hunt for a surface embroidery kit that will help you learn a variety of stitches, that works up into a pretty, flowery design (perfect for Spring! ), check out the new Canevas Folies surface embroidery kits at The French Needle! They look fun, don’t they? These are very pretty – but what if you aren’t into flowers??? And I do think these might be a reason why there are not as many young embroiderers – frankly, these designs look “old” to me. Fortunately, I know how to make my own patterns but so many don’t. At least there are some options now though! 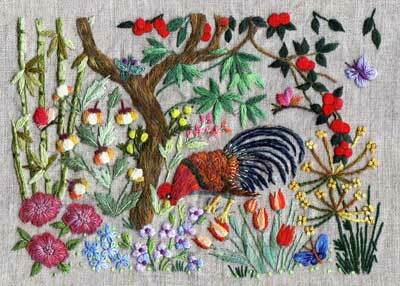 Thanks for this delightful post, how lovely and colourful the kits are and so many different stitches you certainly could get caught up in these tantalising designs of various stitches on foliage. I love the flowered alphabet design, what a lovely present for a toddler. You are so right in getting caught up with a few stitches because they are favourites or easy to apply. Thanks for sharing this with us. I saw these yesterday! If I didn’t have four projects going right now I’d have ordered one. The first one pictured is my favorite and would look lovely in the project room of my day dreams. Oh, Mary — THANK you for these! It is so hard to find decent kits. Heaven knows I have enough projects lined up, but kits like these are always fun to do. Thank you, thank you!! These are absolutely gorgeous! Thank you for posting these. Inspiring! Yes, they’re lovely and will, hopefully, help people to branch out in their stitch repertoire. Actually, I really ‘felt’ it when I read your comment about how we fall back on a small number of commonly used stitches as I don’t suppose I use more than satin, long and short, stem, back, split, cross and lazy stitch as well as French and Bullion knots. OK, there’s a lot one can do with those, but I ought to use more…. oh my goodness, those are perfect! I love them. You are right, it is so rare to find surface embroidery kits, especially if you do not like cross stitch. I do not need another project to add to my stash right now, but Oh, how those summery colors call to me on yet another cold gray day. Most of my current projects are white on white, which just looks like more snow. These are gorgeous, and are going into my (virtual space) bottomless wish basket. Oooo…. you know how much of a traditionalist I am, but these are gorgeous! Thanks for posting this! These are adorable and exactly the kind of thing I’ve been looking for to help learn more stitches. Might have to be watching their store for them to put new ones up. I can’t decide on a favorite, oh dear. Nuts! They are out of the flowered alphabet kit already! I really love that! Hoping they will get more in, but thank you Mary for the info on the kits! You are correct in saying that most of us embroiderers get stuck in a rut with the same few stitches. I am currently in that rut and need to break out, so these kits are a great way to do it! Thank you! G’day Mary, These are gorgeousness contained. Very appealing and approachable, like little friends. Thank you. Cheers, Kath. Thank you for posting this. 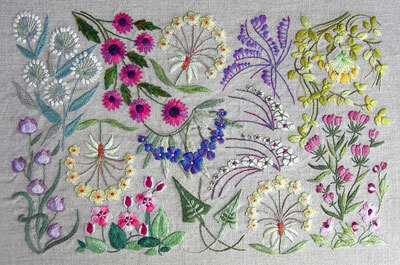 I was just thinking that I would like to work on an embroidery sampler, but hadn’t found one I liked. These are lovely! If you are a beginner, be warned : there are no stitch diagrams, my kit “bees” gave no colour guidance other than the picture. There is a list of stitches, but no clear order of sewing. I wasted my money on this one.